The solution if you host a Scottish Web site and are looking to integrate into your site a Scottish name sept search, clan information - crests, histories, seat illustrations, locations, and all 1300 registered clan and Scottish district tartans. All 341 main clans are covered. In addition there are available several thousand gifs of Scottish related photographs, paintings, heraldy, maps, and illustrations - many dating back to the 19th century. Contact info@clanheritage.com for details of the ClanFinder®Web service. Special rates are available for Clan Societies. Visit the web sites of our associated trade companies. 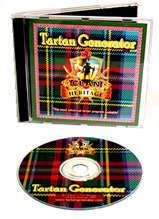 For Scottish Retailer software visit www.clanheritage.com - the home of 'The Clans of Scotland' - incorporating the full version of ClanFinder® with a phonetic name search and clan scroll printing (143 main clans), clan locations, seat illustrations, tartans, crests, clan histories. For the world's largest range of Clan Crested products (currently running to over 200 clans) - and approved by The Standing Council of Scottish Chiefs. In addition a complete range of quality Highland Wear and Accessories - jackets, kilts, sporrans, hose, shoes, sgian dubh, cap badges, kilt pins, plaid broaches, belts and buckles, flasks and cuaiches, and Scottish collectables. Visit www.gaelicthemes.com. Full express international trade dispatch service. This is a trade only site. The member's section includes over 500 downloadable product gifs for use on member's web sites. Stop Web! Sept Search on your WAP phone! Check out the Scottish connections of friends and colleagues anywhere with your WAP phone. This world first service is in beta but fully operational. Key www.clanna.com into your WAP phone to try this free service.